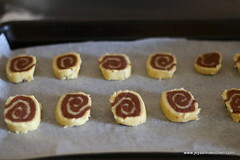 Pinwheel cookies i am attempting for the first time but i am so happy with the results. 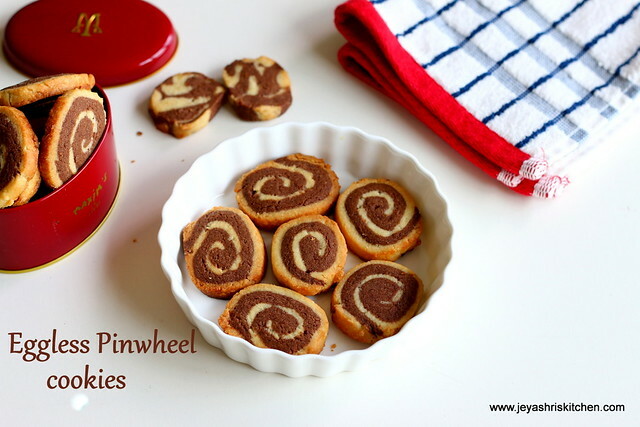 I was in a dilemma whether to make short bread cookies or chocolate chip cookies, but finally decided to make pinwheel cookies. 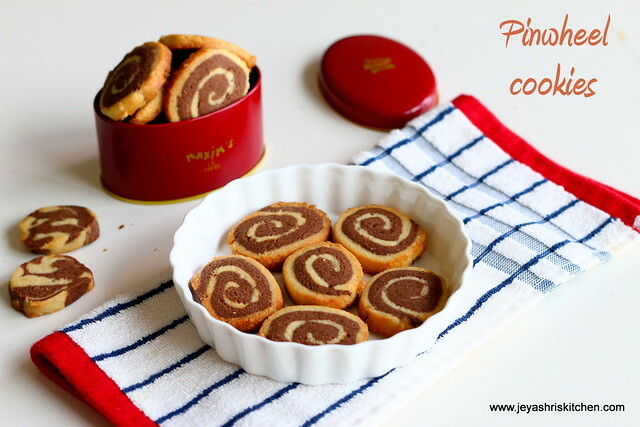 I saw few videos in you tube and had an idea as how to make pinwheel cookies. I made an basic eggless vanilla cookie dough and added some melted chocolate chip to make a chocolate dough. I am so happy with the results . 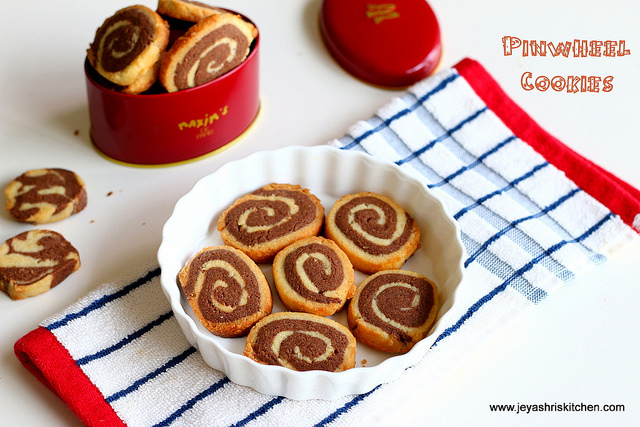 Do give it a try at home and for sure your kids will love this. 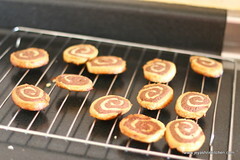 The recipe of the basic cookies is from Joy of baking. Add powdered sugar and butter in a bowl. Mix this well. 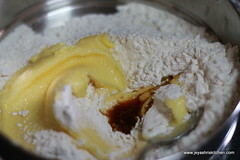 Add this mixture to flour and add vanilla essence. Mix well and make this into a pliable dough. If needed add few drops of milk while kneading. Melt 1/4 cup of chocolate chips using double broiler method. Divide the dough into 2 equal portions. 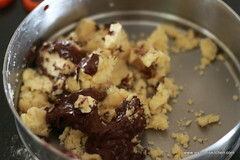 Add the melted chocolate to one portion of the dough. Knead this into a smooth dough. 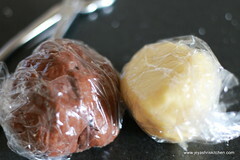 Cover both the dough separately using cling wrap and keep it in the refrigerator for 20 minutes. 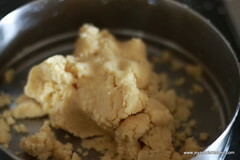 After 20 minutes roll the dough , if you need you can add little milk, if the dough is very dry. 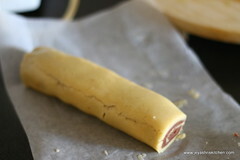 Roll both the dough separately and put one on top of the other and roll very gently. 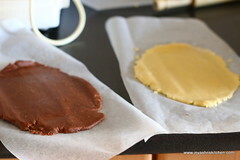 While rolling put them on a butter paper as shown on the picture. 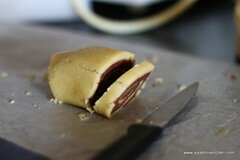 Roll them into a rectangle , even if comes as oval no worries , you cut the edges and make it into a rectangle. 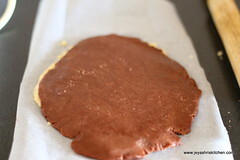 The cut edges you can just roll it and make it into marble cookies. Carefully roll it into a log shape. 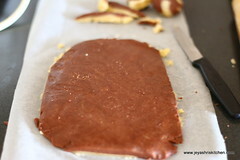 Slice them into a cookies as shown in the picture. 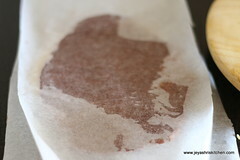 Line them on a baking tray spread with parchment paper | butter paper. 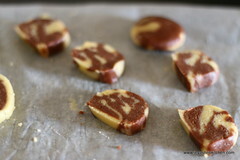 The second one are the marbled cookies. Preheat the oven for 5 minutes at 160 degrees and bake them for 10 minutes at the same temperature. Allow this to cool completely. After that if you feel that the cookies are still soft bake them for 3 minutes again. Enjoy the cookies . We all loved this cookies very much. My son who generally never eat cookies liked this very much. Always ensure the dough is smooth and without any cracks. else while rolling it into a log it will break. This lesson i learnt from my own experience. you could see some cracks in my log too. Nice step by step pics. Cookies look good Jayashri. I really like your versatile recipes. Cute looking cookies..love to have one...super. Awesome!! Can I have some ??? Baking powder add pannalama mam? Tried. Yummy and crunchy cookies.thanks. Can we use chocolate syrup instead of chocolate chips? ?